To kindle the intellectual growth and create useful, productive citizens. To attain the normal emotive growth and allow and assist the fellowmen to live, respect and mutually share. To create healthy citizens who will realize the vast potentials of human strength in the building up of self and society. To perpetuate the value system of respect for elders and love for youngsters and the cultural moral traditions handed down from our ancestors and pass on an improved future to the next generation. R.G.M assures the students an opportunity to develop their potential to the fullest and achieve the highest possible level of educational qualifications before they step into this competitive world. The School aims at imparting quality education using the latest educational technology, Visual-aids, Compulsory Computer Education etc. It provides ample facilities for games and sports. It aims at an all round development of personality and fine traits like leadership, honesty, courage, truthfulness, initiative and social responsibility are stressed. Emphasis will be laid on good turnout, correct bearing and a high standard of personal and social conduct and appreciation of moral and spiritual values. The school follows the syllabus prescribed by the Tamilnadu State Matriculation Board for classes 1 to X and for classes XI and XII, Higher Secondary School syllabus of Tamilnadu State Education Board. Rajalakshmi Genguswamy Matriculation Hr. Sec. School with a total land area of 3.5 Acres was incepted on 9th June 1985 with strength of 324 children with classes from Junior KG to VIII. The School secretary is Mrs. Nandhini Raveendran. She believes that success can only be achieved through proper coordination between the faculty and the students. The School has successfully completed its 25th year of existence comprising promising school strength of 2700 pupils. Heading towards its silver jubilee year of celebration, we take pride in the fact that RGM School is the first Matriculation School in the town. 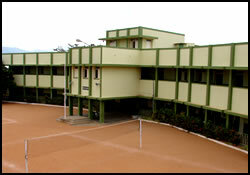 The aim of the School is to provide quality education and enlightenment through English medium and instil in the minds of the young, virtues such as obedience, humility, love for nature, respect for elders and patriotism, universal brotherhood and to make all the young children shed narrow feelings of caste, creed, regionalism & parochialism. Besides, our unique teaching system helps imbibe good values and mould student’s character, vital for the development of the nation. This is the first school in Udumalpet to be accredited the prestigious ISO 9001: 2008 certification. We are pioneers in Tirupur and Coimbatore Educational Districts in being re-acrredited with the new ISO standards 9001:2008. The School has separate hostels for boys and girls, that are well furnished and good vegetarian food is also offered by us. As one who still believes and trusts in the all round development of children, here we provide the best forum. "Discover before you discard" is our motto. To discover the varied cultural heritage of our country, study tours and trekking to places of interest are organized by the school for the benefit of growing minds of our schools. Today, the School offers instructions from classes 1 to 12 besides Kinder Garden classes. The courses are extremely useful for students who are keen to continue their higher education in the State of Tamilnadu and those who will be pursuing professional education in some of the elite professional colleges in the other states of India.